The various substrates we offer are used as dimensional cut or formed products in addition to the standard pressure sensitive vinyl applications. Pressure sensitive vinyl is typically a mix of both solid color cut and digital print. High impact polypropylene copolymer. At regular temperatures most oils, solvents and water have no effect, allowing it to perform under adverse weather conditions or as a product exposed to harsh chemicals. Light weight, economical, water resistant. Applications: exterior temporary signage. 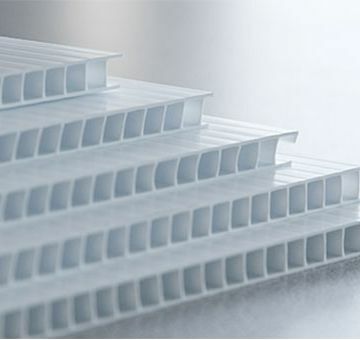 Lightweight yet rigid board of moderately expanded closed-cell polyvinyl chloride (PVC) extruded into a sheet format with low gloss matte finish. Heat formable and chemical resistant. Primary color is white with limited availability by thickness in yellow, red, black and blue. Medium term application longevity, both interior and exterior (UV breakdown during long-term exposure). Applications: rigid waterproof backing for any interior application, posters, point-of-purchase display, dimensional cutouts, placards, exhibits. Solid aluminum sheet painted white on both sides, standard sizes for real estate riders and sign blanks in the .040” thickness and standard parking signs of 12” x 18” in the .080” thickness. Thinner aluminum is best used within a frame with the thicker material with hold up in a post mounted application. Applications: exterior small scale (less than 6 square feet) vinyl signs. White or colored (limited) Aluminum sheet matte one side and gloss one side with a polyethylene core. Excellent outdoor application substrate with 5 year finish warranty. Applications: exterior medium scale (up to 32 square feet) vinyl signs with supporting frame or wall mount, individual dimensional lettering. Strong, aluminum composite panel with a high density, corrugated polyallomer (CPA) core that will not swell, wick water, corrode, rot or delaminte even under prolonged water exposure. Both faces are high-gloss painted aluminum. Average outdoor life expectancy of 10 years. Applications: exterior, lightweight 4' x 8' sheet vinyl signs. Plastic sheeting in various grades, colors and sizes to meet many signage needs. Impact resistant, solvent resistant, thermoformable, weather resistant. Applications: backlit sign face, custom formed signs, dimensional cut letters and graphics, push through lettering. Medium Density Overlay plywood. Exterior grade plywood is faced with resin-impregnated medium density overlay that is specially formulated for painting or vinyl application. Applications: exterior rigid vinyl sign applications, typically mounted between in ground posts.